There are literally thousands of Waffen SS wartime images. However, unless you are quite experienced and knowledgeable they can be difficult to find or identify. Therefore, we are adding a “Featured Pictures” page to our website which we will frequently update. We do hope you will enjoy our photographs and your comments are very welcome. The Wehrmacht developed Kradschützen as a rapid mobile assault and reconnaissance force from 1936 and were used extensively during the early stages of the Second World War as part of the German Blitzkrieg successes (1939-1940) and Operation Barbarossa Invasion of Russia (June 1941)…. 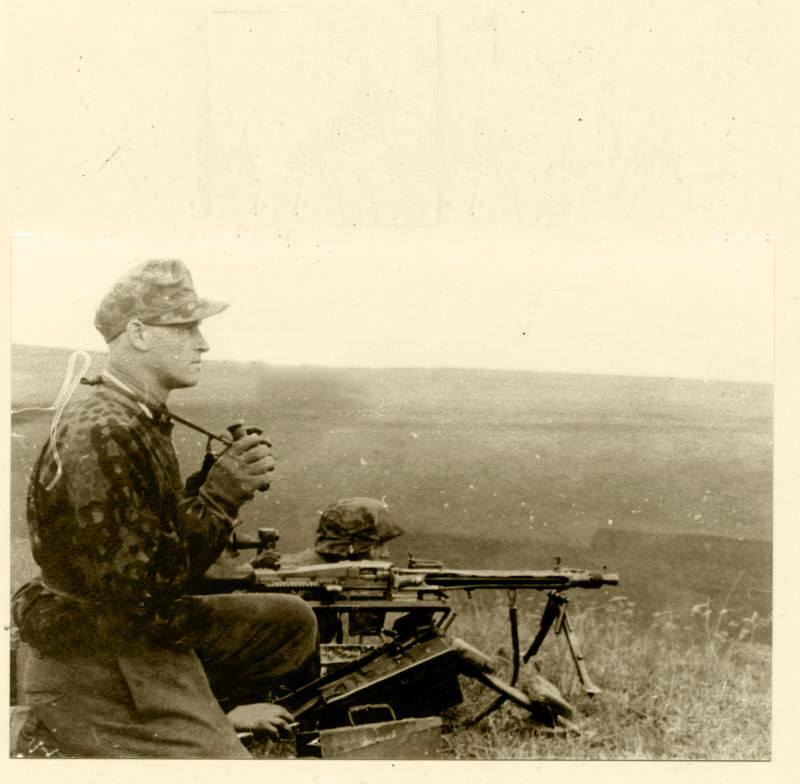 Great picture of a Waffen SS MG42 Gun Team with classic SS camouflage smocks, cap and helmet cover. 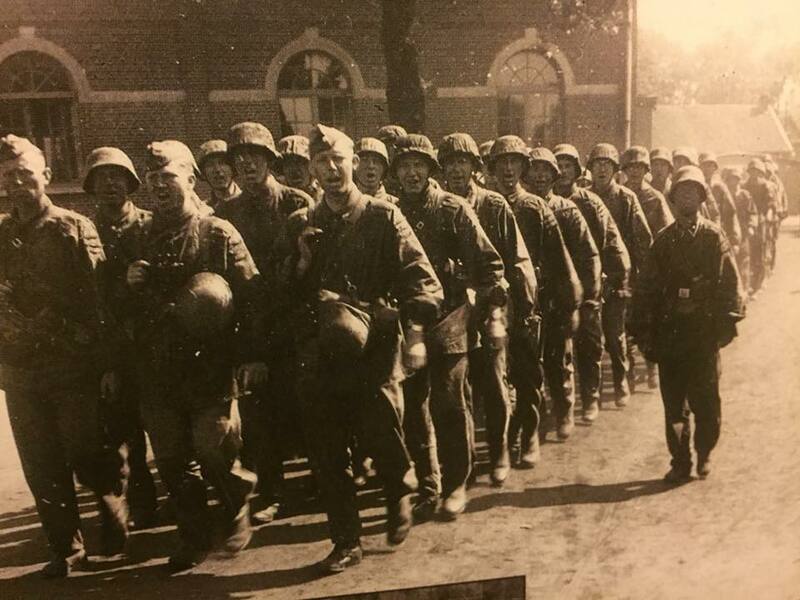 Waffen SS marching troops (Zug). Recently found this picture on the internet which had a caption stating it was a squad of 9ss Hohenstaufen recruits in training, which is difficult to confirm. However, from the kit worn the photograph could be mid war period (1941-1943) e.g. smocks, side caps and low boots…. Waffen SS Granatwerfer Mortar Crew. The 8 cm Granatwerfer 34 was the standard German infantry mortar throughout World War II. It was noted for its accuracy and rapid rate of fire. 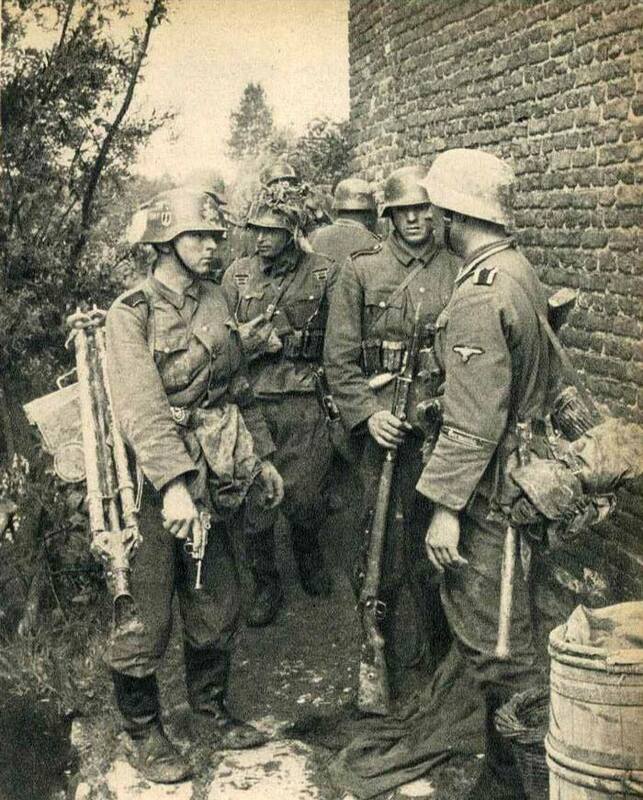 Waffen SS NCO group briefing prior to a combat mission. 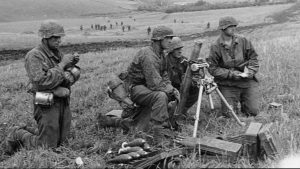 Note use of classic SS camouflage smocks, helmet covers and combat equipment. 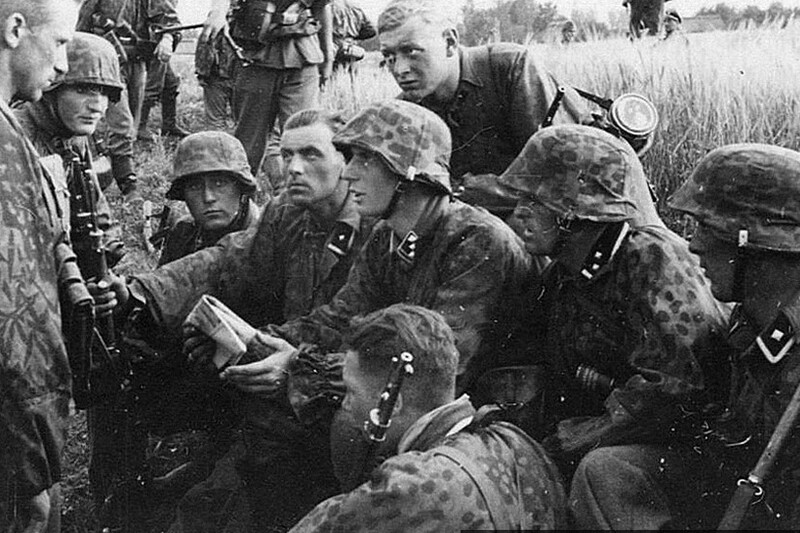 Waffen SS NCO group briefing perhaps prior to a combat mission. Waffen SS Germania soldiers during the Blitzkrieg in France, 1940. Dressed in wool tunics. Note the lack of camouflage smocks and helmet covers. 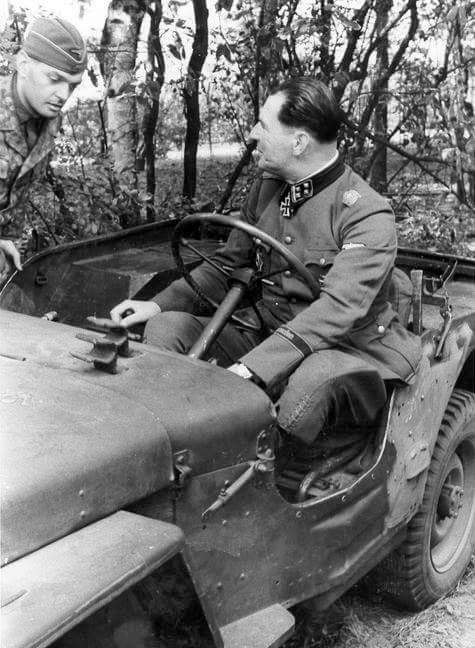 Waffen SS Leibstandarte Panzer Division Schwimmwagen Type 162 on Eastern (Ost) Front, Russia, driven by SS-Hauptsturmführer Gustav Knittel, commander of 1st SS Panzer Reconnaissance Battalion, 1.SS Panzer Division Leibstandarte Adolf Hitler, LSSAH. 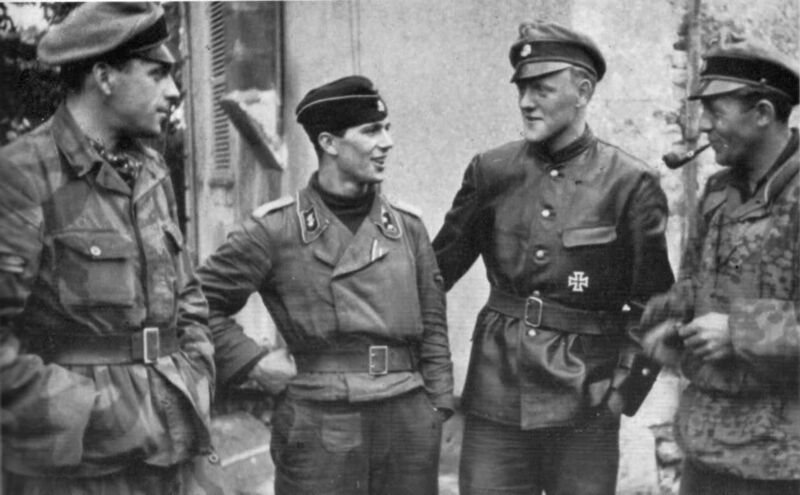 Waffen SS Officers and NCOs with various jacket styles. Left to Right: Captured Italian Camouflage Four Pocket Tunic, Field Grey Assault Gun Tunic, U Boat Crew Leather Jacket, Camouflage Smock. 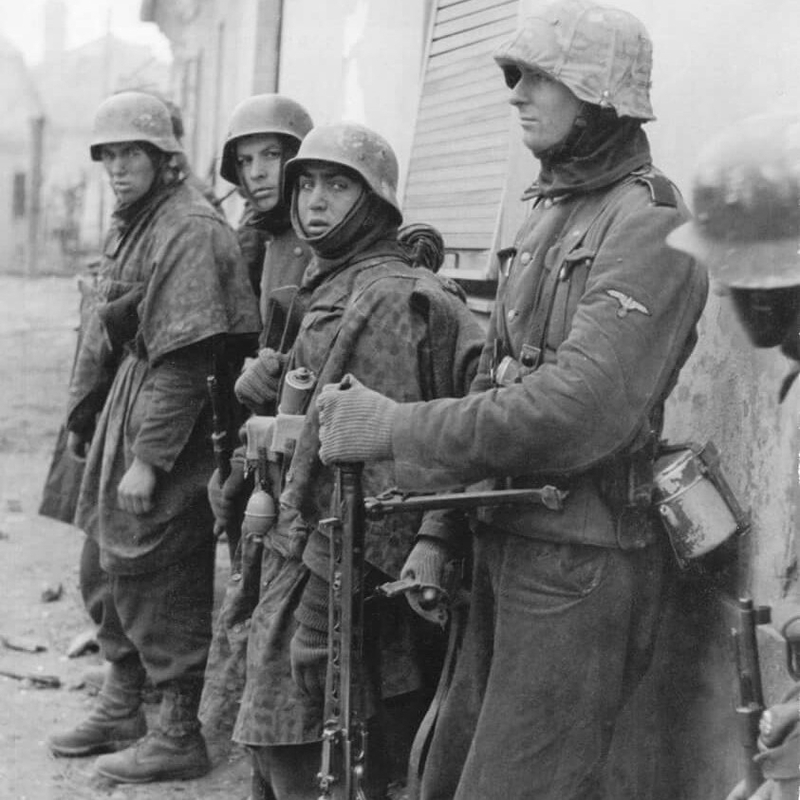 Waffen SS Kradschützen motorcycle troops from the Liebstandarte Adolf Hitler Division wearing the classic Kradmantel waterproof jacket during early stages of the invasion of Russia – Operation Barbarossa 1940. Captured British Airborne troopers and Jeep during Operation Market Garden, Arnhem 1944. 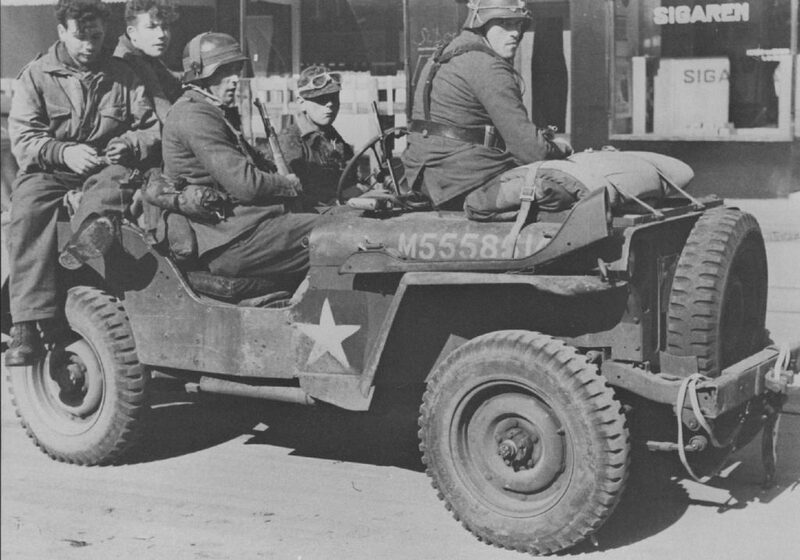 Captured US Jeep with British Airborne troopers POWs during Operation Market Garden, Arnhem 1944. 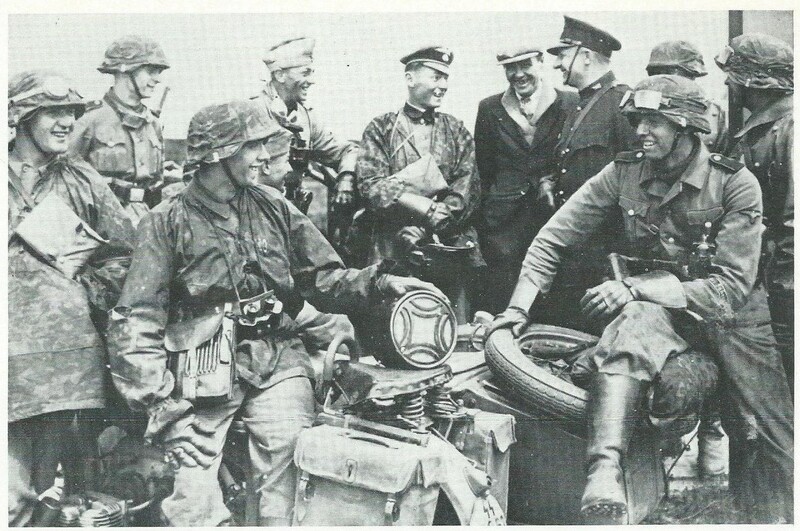 The German driver probably belongs to one of the Waffen SS Panzer Divisions (9ss Hohenstaufen or 10ss Frundsberg) as he appears to be wearing a Waffen SS camouflage tunic and cap whilst the German passengers appear to be from a Heer unit. Also, the SIGAREN shop window sign is Dutch for cigarettes which indicates this original wartime photo was most likely taken during the Arnhem battle of September 1944. 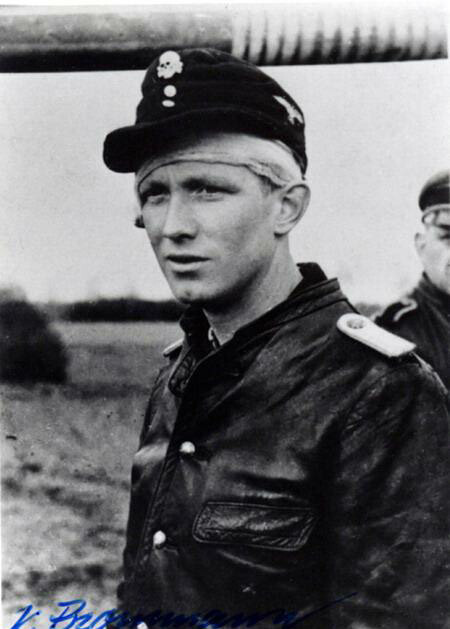 Waffen SS Karl Brommann was a German Panzer Ace. His King Tiger and crew are credited with knocking out 66 Soviet Heavy Tanks, 45 AntiTank Guns and numerous trucks. 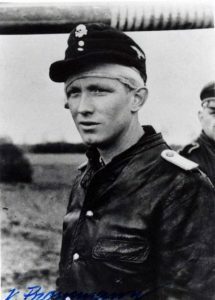 In this picture Brommann wears the classic U Boat leather jacket commonly used by German panzer crews for the additional protection leather provided. German Panzer Ace SS Hauptsturmführer Michael Wittmann wearing the classic U boat leather jacket preferred by many German SS and Heer Panzer crews for the additional protection they provided. It is thought that the Kriegsmarine gave a significant amount of leather clothing to the Italian Navy. 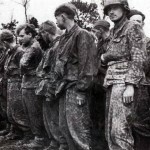 In 1943 when the Italians surrendered to the Allies the Waffen SS Leibstandarte Adolf Hitler Panzer Division (LAH) took part in quickly disarming the Italian Forces and seized considerable quantities of these uniforms and Italian camouflage clothing, which was then used by the Waffen SS LAH Panzer Regiment and other Wehrmacht forces. Later, when key LAH personnel were transferred to the newly formed 12.SS Panzer-Division Hitlerjugend they also used the leather and Italian camouflage clothing. 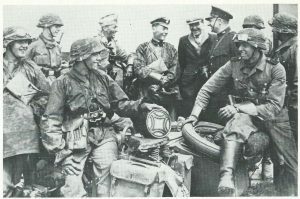 There are many period wartime pictures of Waffen SS and Heer panzer crews wearing U boat leather and Italian camouflage clothing. Waffen SS young recruits wearing classic “Oakleaf Fall” Reversible Camouflage parkas and trousers (Autumn/Winter 1944-45). 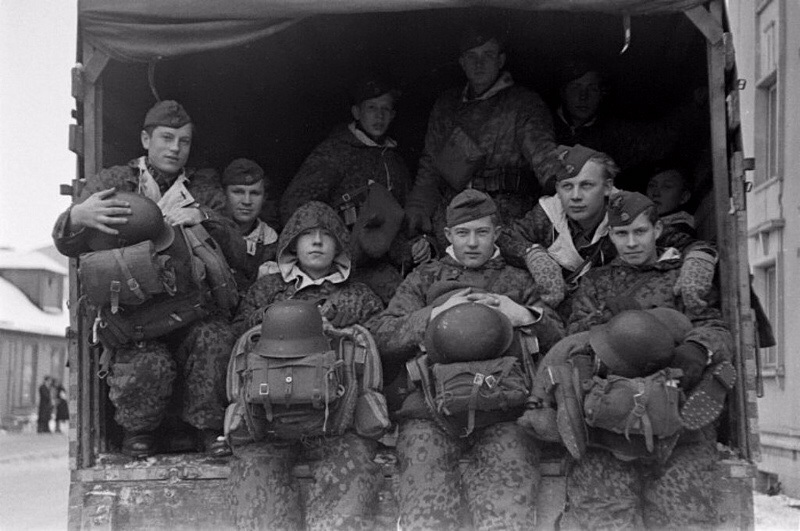 Young Waffen SS soldaten wearing the classic “Fall Oakleaf” reversible camouflage parkas, trousers and gloves. Probably Autumn / Winter of 1944-45 period (Ref: At The Front (ATF) USA). Waffen SS Prisoners of War at Caen, Normandie (June – August 1944). 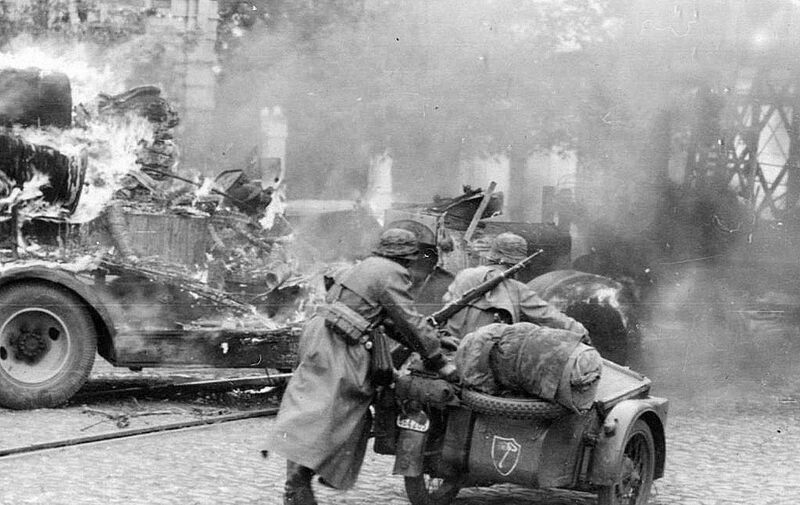 Waffen SS Prisoners of War at Caen 1944 following the intense fighting around the city in the days after D-Day, possibly from 12. SS Hitlerjugend or 9. SS Hohenstaufen. 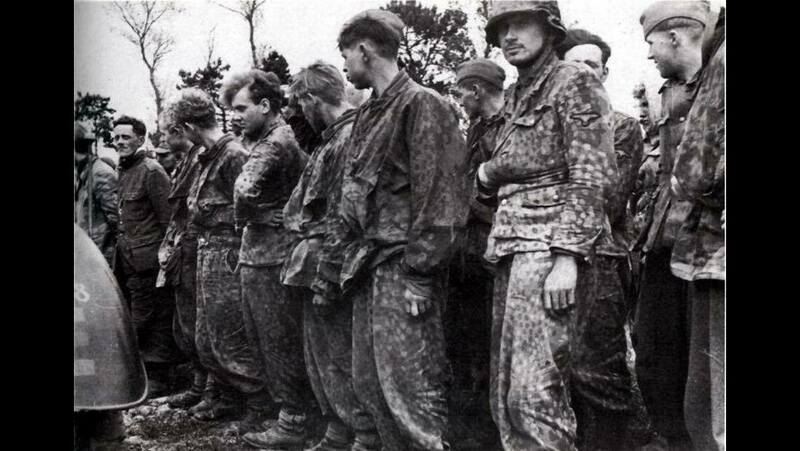 This picture shows the German soldiers wearing the late war classic Waffen SS Erbsenmuster camouflage tunic and trousers. The Erbsenmuster or pea-dot pattern (also known as Dot 44, dot pattern or Peas 44) was one of a family of German camouflage patterns, and was first issued on 1 March 1944. The pea-dot was a major departure from the earlier camouflage smocks. The two piece uniform was designed to be worn over the wool service uniform or by itself and was designated as both a combat and work uniform. The more common later version featured a jacket without the shoulder board loops or insignia and made from herringbone twill. In the picture beside some of the soldiers also wear the older style camouflage pullover smocks as well as Erbsenmuster Pea Dot camouflage. Erbsenmuster camouflage is a firm favourite with modern day militaria collectors and living history re-enactors who tend to call this camouflage pattern “Pea Dot”. 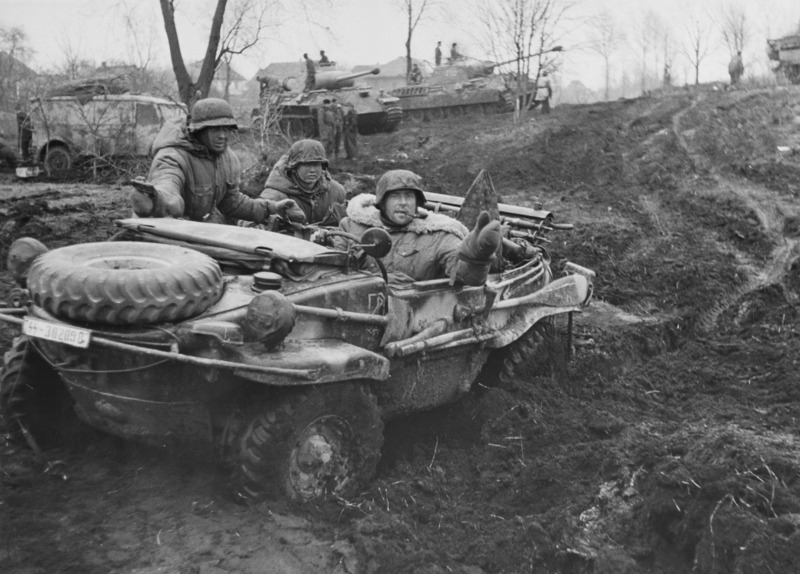 9ss Hohenstaufen Walter Harzer driving a captured Jeep during the Allied Operation Market Garden at Arnhem September 1944. In April 1943, Harzer was assigned to the 9ss Panzer Division Hohenstaufen. The division participated in relief attack on Tarnopol and later took part in the Battle of Caen. On 19 August 1944, Harzer was decorated with the German Cross in Gold for his leadership during the operations in Normandie. As Hohenstaufen was ordered for a refit in the Netherlands, Walter Harzer became its fifth commander, taking over for SS-Oberführer Friedrich-Wilhelm bock. However, on Sunday 17 September 1944, the Allies launched Operation Market Garden and Harzer’s division was engaged in the Battle of Arnhem. 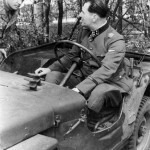 Harzer was awarded the Knight’s Cross of the Iron Cross for his actions during these battles. 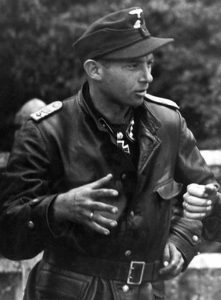 On 10 October 1944 Harzer left Hohenstaufen and went on to become the Chief of Staff of V SS Mountain Corps before receiving the command of the 4th SS Polizei Division at the end of November 1944. Together with the rest of this division Harzer surrendered to the American Army near Wittenberge-Lenzen, Germany on 8 May 1945. After the war Harzer worked as an official historian for HIAG, an organization of former Waffen-SS members. He helped coordinate the writing of numerous tendentious unit histories and memoirs by former Waffen-SS officers. Harzer died after a heart failure in Stuttgart hospital on 29 May 1982 (Ref: Wikipedia).